While working on a new evaluation project with the Freiburg Museum Natur und Mensch, I’ve come across an interesting example of how un-prompted visitor-contributed content can work. In the temporary exhibit “Letzte Ölung Nigerdelta,” one room invites visitors to sit and watch a projected series of photographs exploring the social, economical, and environmental affects of the oil industry in Nigeria. It’s a powerful space. Even without captions or narrations, the images are moving and emotional. The screening room, seen through a dividing curtain. The edge of the Post-it note wall is to the left. Other than chairs and the images, the only other thing in the space is a small Post-it note wall for visitor thoughts. But unlike most other similar visitor-contributed content opportunities I’ve seen or worked with, this one has no visitor prompts. There’s no questions to answer, no ideas to consider, no comments to respond to. The talkback station is just a wall, a stack of Post-it notes, and pencils. Visitors are free to use it however they see fit. The wall is continuously full, and approximately 50% of the comments each week are new. In unobtrusive observations, 54% of visitors to the exhibit are contributing to the wall. Visitors don’t appear to be confused about whether or not they can write on the wall, or what they’re expected to write. So far, 92% of the responses are “appropriate.” Nina Simon talks about a simple way to measure visitor-contributed content appropriateness here. Because there’s no prompt in this space, appropriateness is defined as being related to the content of the exhibit. The majority of inappropriate responses appear to have been written by children (based on handwriting). The comments are evenly split between being reactionary (something is good/bad, a visitor likes/doesn’t like it) and constructive (where the visitor offers ideas and suggestions in response to the content of the exhibit). As of yet, visitors are only responding/reacting to the photographs, and not to other visitor comments. The exhibit will be open for several more months, and I’m curious to see if the activity I’ve observed continues, or if there’s a change in visitor contributions the longer the exhibit is open. But here, for now, are some preliminary thoughts. Evocative content. 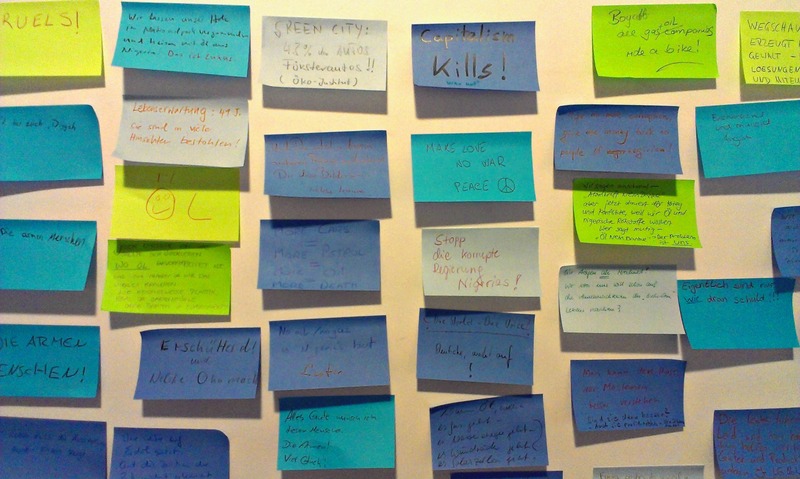 The images elicit strong emotions in visitors, and many visitors use the Post-it notes as an outlet to share their reactions. A strong local connection. Freiburg is known as Germany’s “Green City,” and natural resource issues are important to a large percentage of the population. A clean, uncluttered space. Often, visitor feedback spaces are in strong visual competition with other exhibit elements. 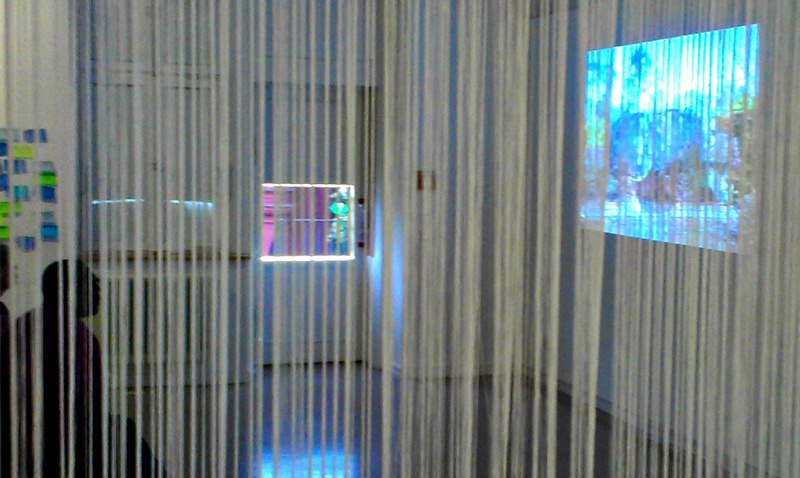 In “Letzte Ölung Nigerdelta,” the room is empty except for the projected images and low seating. Good placement. The feedback space is next to the entrance/exit of the exhibit, so visitors see it twice. Most visitors notice the wall when they enter, but read and contribute to it as they’re leaving. An adult-focused exhibit. This exhibit’s primary audience is adults. 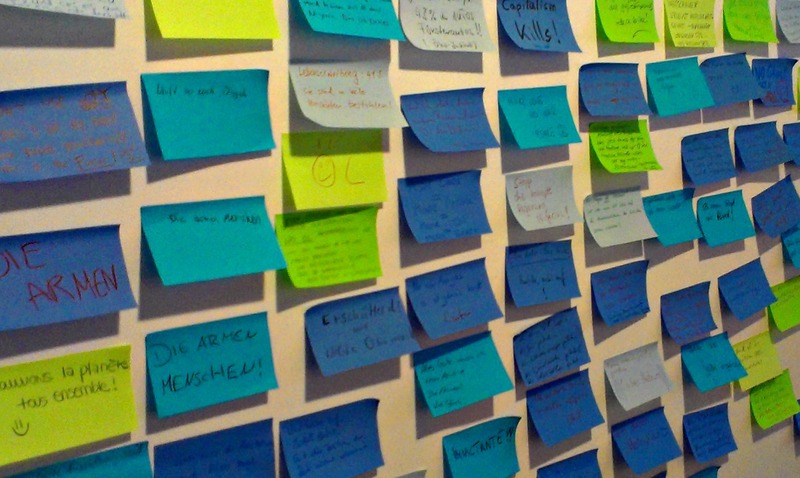 Compared to a similarly-sized and -placed Post-it note wall in a children’s exhibit in the museum, “Letzte Ölung Nigerdelta” receives about twice the number of responses, and over three times the number of “appropriate” responses. All that said, I do wonder how the experience might change if prompts were included. Would more visitors contribute, or fewer? Could we create scenarios where visitors comment on each other’s thoughts, building larger discussions and debates, instead of mainly reacting to the images? Ultimately, for this space and content, what best serves the visitors: a place for a dialogue, a place for an outlet, or a place for some other combination of the two?